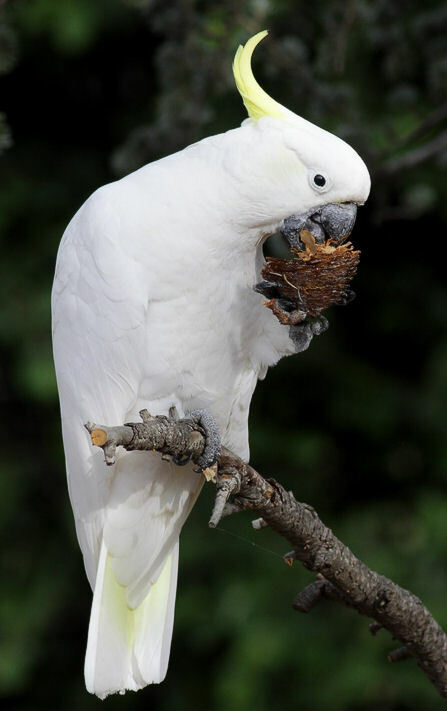 The main food, dry foods and fresh foods, and the additional foods (like animal protein) are essential for cockatoos to stay healthy. Treats are foods that are tasty and may actually contain some healthy nutrients, but they are not essential. Nuts are very healthy for your bird, but they do contain a lot of fat. Feeding too much of it is not recommended. As a treat or a reward to preforming a trick they are excellent. You can feed almost any kind of nut, as long as they are not salted or roasted. For example walnut, peanut, almond and pecan nuts. You don’t need to crack the shell before you give the nut to your cockatoo, that’s what the bill is for! Dried fruits are also a favorite for cockatoos; e.g. dried banana chips, apple chips and raisins. These dried fruits lack the healthy vitamins of fresh fruits but do contain fibers. They can be fed as tasty snacks or given as a reward when learning a trick. Check the packages of the dried fruits for added salt or sugar. It’s best to avoid those kinds and choose the most natural unprocessed dried fruits. You don’t need to look for special animal food dried fruits, the dried fruits for people are excellent too. Do not feed your cockatoo fries, cookies, candy, chocolate, jelly, soda, cola, coffee, pure sugar, syrup and salted food. These things are very bad for a cockatoo. A cockatoo is not like a human and should not be fed as such. One of the many differences between the digestive system of cockatoos and humans, is that the kidneys of cockatoos are unable to excrete concentrated salts. Because a cockatoo is so much smaller than people, people underestimate the amount of unhealthy food they give to their cockatoo.